Because Hexham lies close to Hadrian’s Wall and the important Roman military supply base of Corbridge it has often been speculated that the town must itself have been a Roman settlement. However, no evidence has ever been found to substantiate this. In the crypt of the Abbey, which dominates the town’s skyline, there are certainly Roman stones but these were brought from the ruins of Corbridge by Saint Wilfrid in 674 when he founded a monastery on the site. Overlooking the east-west route of the Tyne valley, Hexham was certainly of strategic importance from the time of St.Wilfrid onwards. The Anglo-Saxon Chronicle records the murder of King Ælfwald by Sicga at Scythlecester (which may be modern Chesters on the North Tyne) in 788 and that he was buried in the church of Hexham. The town’s name possibly originates from Wilfrid’s time. One theory is that it derives from the Old English Hagustaldes ea and later Hagustaldes ham, the elements possibly denoting a younger son who takes land outside the settlement, which could have referred to the land of Hexham west of the older settlement of Corbridge. This period was the focus of a special issue of Hexham Historian 7, and an article on the excavation of the Roman bridge piers at Corbridge is in Hexham Historian 15. However, the modern form appears to derive from Hextildesham, in use from the late 12th century when the hamlets of Cockshaw, Priestpopple and Hencotes merge around the Market Place. Hextilda was a Saxon/Scots heiress of Tynedale and benefactress of the priory. 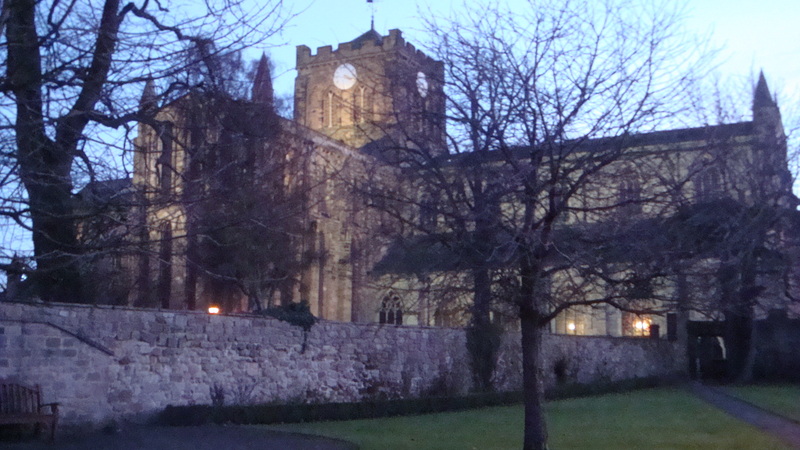 The current Hexham Abbey (pictured) dates largely from the 12th century onward when it was refounded as a priory in the wake of the Norman Conquest. 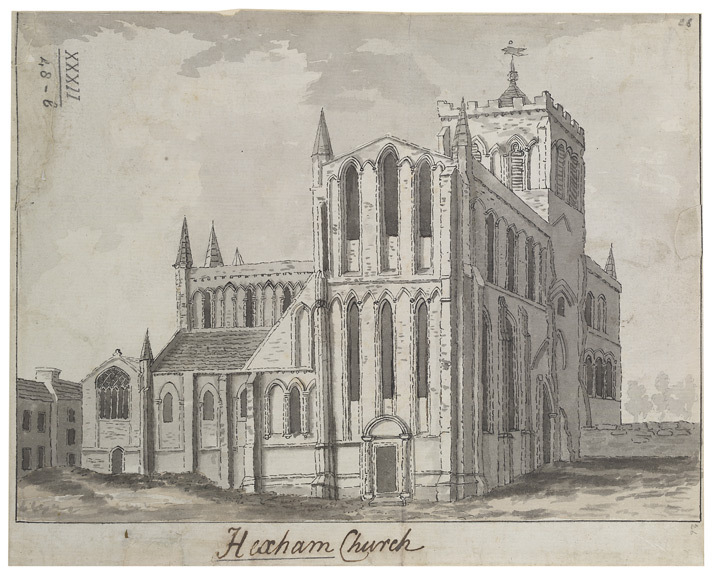 The architecture of the Early English priory was described in Hexham Historian 23, and its priceless medieval paintings in Hexham Historian 21. The Moot Hall stands on the far side of the market place from the Abbey, an imposing medieval tower, as is the Old Gaol just beyond, the oldest purpose built prison in England. The Priory’s estates are described in the our publication The Black Book of Hexham, the first translation into English of this and other important medieval documents. Fortifications such as these were important in this border region. Hexham suffered from the border wars with the Scots, including attacks from William Wallace who burnt the town in 1297. In 1312, Robert the Bruce demanded and received £2000 from the town and monastery in order for them to be spared a similar fate. For more than two centuries afterwards Tynedale and Hexham were vulnerable to raids by ‘border reivers’ and usually responded in kind on the Scottish side of the hills. The area was also affected by conflicts arising within England itself. 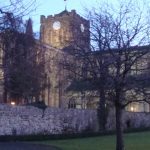 In 1464, the Battle of Hexham was fought somewhere to the south of the town during the Wars of the Roses, and the defeated Lancastrian commander, the Duke of Somerset, was executed in Hexham market place (more details in Hexham Historian 24). The dissolution of the monasteries during the reign of King Henry VIII saw the end of Hexham Priory, but not before some truculent resistance from the remaining priors (covered in Hexham Historian 11). The Priory’s church (shown from the north, and drawn before the rebuilding of the nave in the late 19th century) has remained as the town’s parish church since the dissolution, generally known today as ‘Hexham Abbey’. The adjacent monastic premises became a private house granted first to the Carnaby family in the 1530s. 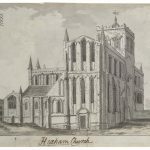 Part of the surviving building was reunited in the ownership of Hexham Abbey in 2012, and was the subject of a conservation project summarised in one of our recent publications, Hexham Abbey Revealed. Hexham shared in the rising local trade and prosperity generated by the growth of Newcastle from the Elizabethan period, and became renowned for its various leather related trades and lead mining in the hills to the south. Some idea of life in Hexham and the surrounding area (still known as Hexhamshire today) can be found in the collection of letters published as A Pack of Idle Sparks. Hexham’s weekly market and annual fairs became increasingly important. The market place was therefore an obvious location for the raising of the standard of the Pretender James Stuart by the ill-fated Jacobite rebels in 1715, led by the local Catholic noble the Earl of Derwentwater. The market place was also the location of the Hexham Riot in 1761 when a crowd protesting about changes in the criteria for serving in the militia was fired upon by troops from the North Yorkshire Militia. 51 protesters were killed, earning the Militia the soubriquet of The Hexham Butchers. One rioter, Peter Porter, was eventually hung as a ringleader of the riot. Hexham’s history has been more peaceful since then. The leather industry grew through the eighteenth and nineteenth centuries, becoming renowned for its gloves known as the Hexham tans. Some of the leather-working remains can be seen in the Cockshaw area of the town today. In the decades following the arrival of the railway in 1835 Hexham became something of a commuter town for Newcastle, and its insalubrious sanitation improved after a damning report by the Board of Health (see publications Dirty Old Town and Hexham 1854-1939). Today it remains a busy market town and a great base for touring Hadrian’s Wall and the historic Northumbrian countryside. If you’re looking for a book giving a good summary of the town’s history, take a look at Hexham Heritage. A much more detailed timeline for Hexham and its development is on this web site and also available in a shortened printed version.